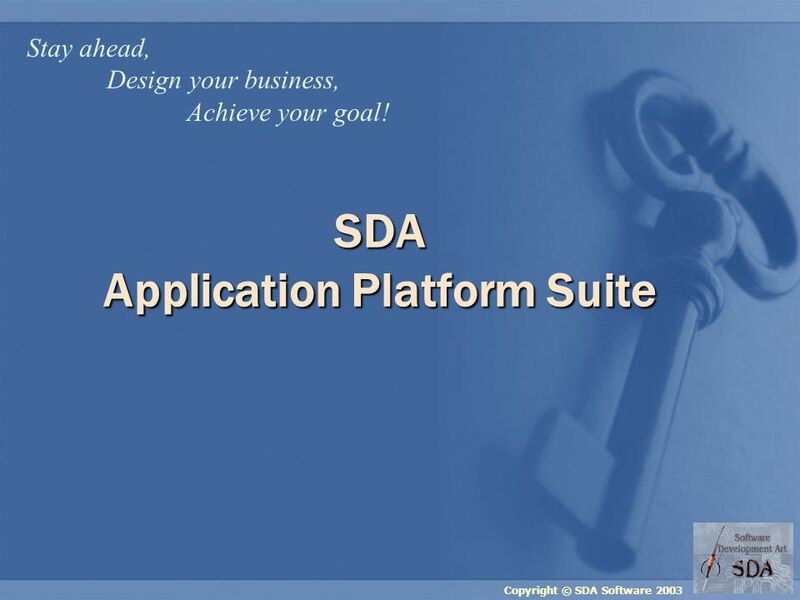 Copyright © SDA Software 2003 SDA Application Platform Suite Stay ahead, Design your business, Achieve your goal! 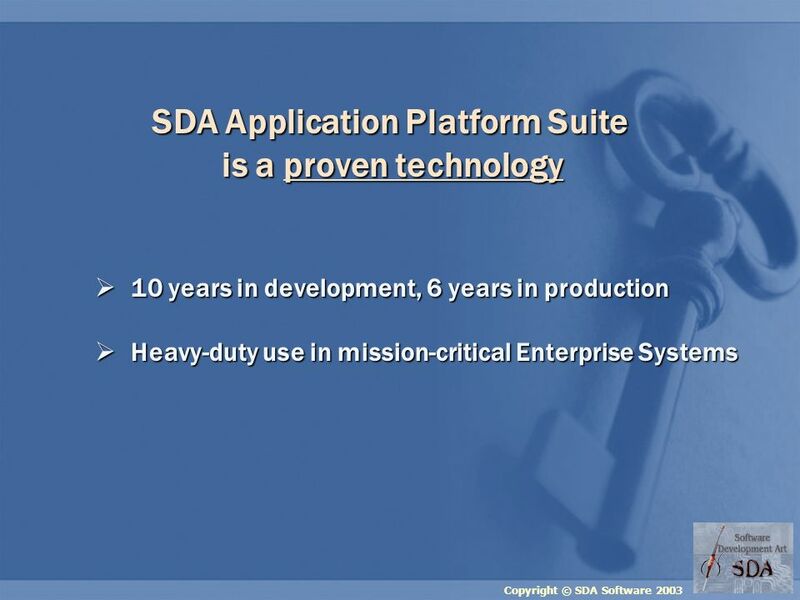 1 Copyright © SDA Software 2003 SDA Application Platform Suite Stay ahead, Design your business, Achieve your goal! 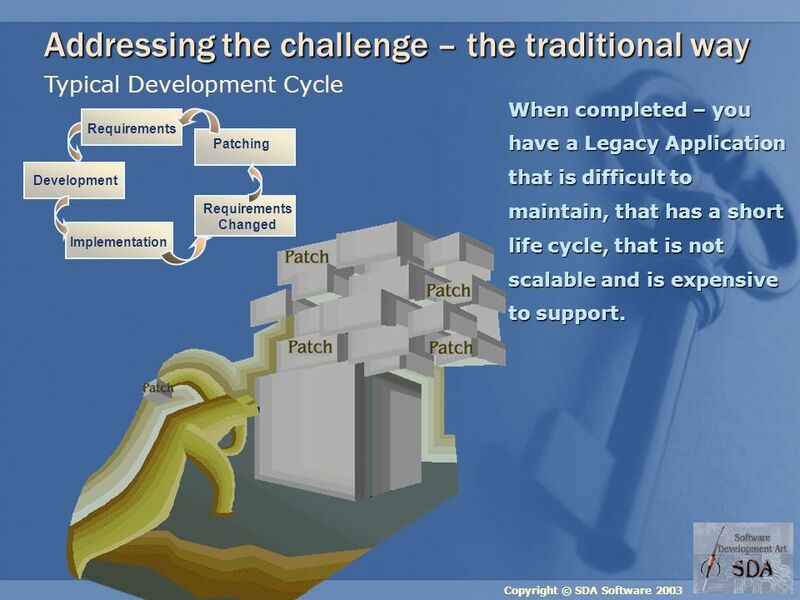 6 Copyright © SDA Software 2003 Typical Development Cycle Patching Requirements Development Requirements Changed Implementation Addressing the challenge – the traditional way When completed – you have a Legacy Application that is difficult to maintain, that has a short life cycle, that is not scalable and is expensive to support. 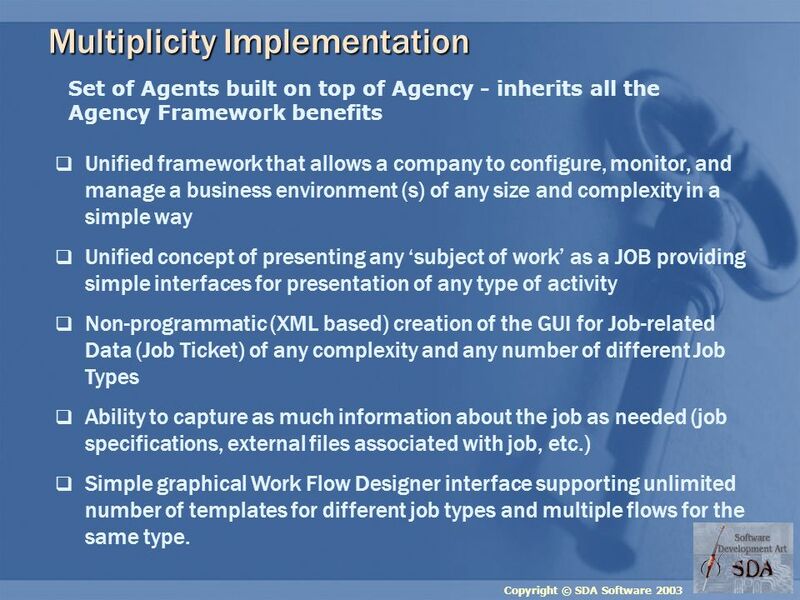 17 Copyright © SDA Software 2003 Multiplicity Implementation Set of Agents built on top of Agency - inherits all the Agency Framework benefits Unified framework that allows a company to configure, monitor, and manage a business environment (s) of any size and complexity in a simple way Unified concept of presenting any subject of work as a JOB providing simple interfaces for presentation of any type of activity Non-programmatic (XML based) creation of the GUI for Job-related Data (Job Ticket) of any complexity and any number of different Job Types Ability to capture as much information about the job as needed (job specifications, external files associated with job, etc.) 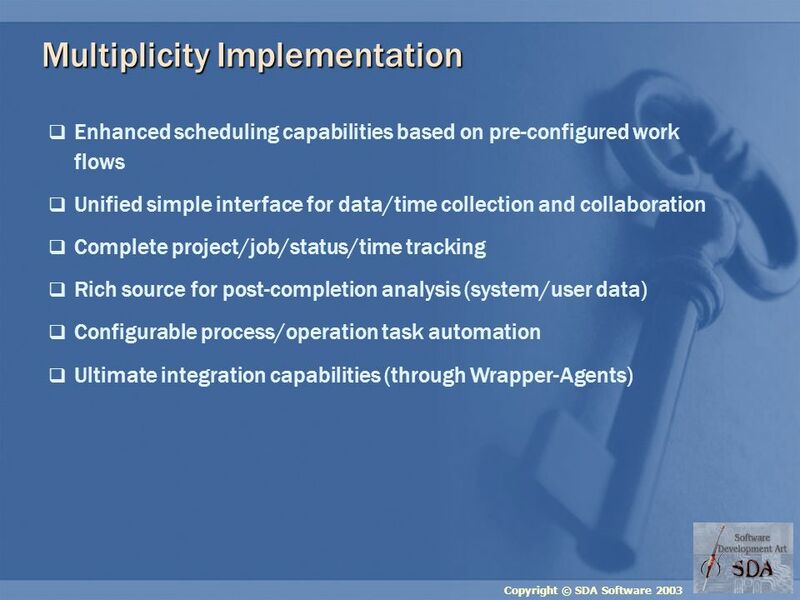 Simple graphical Work Flow Designer interface supporting unlimited number of templates for different job types and multiple flows for the same type. 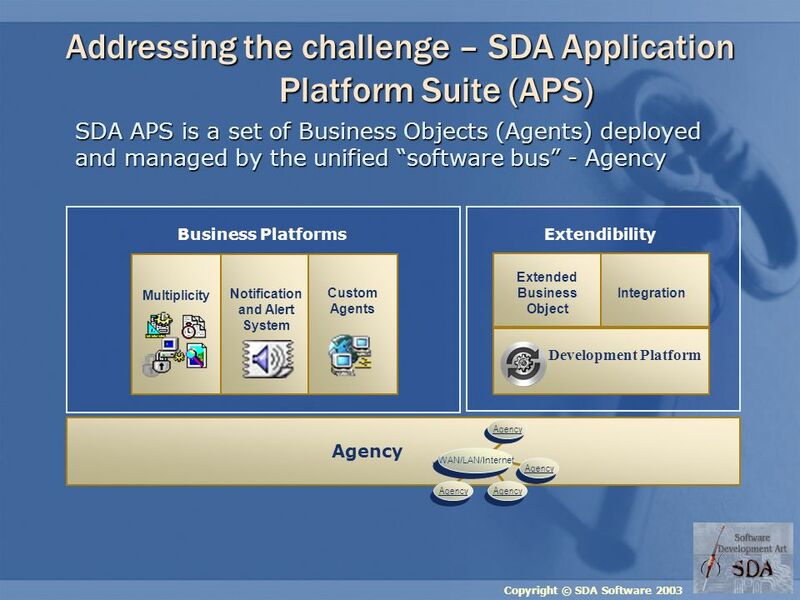 20 Copyright © SDA Software 2003 Integration Integrate back-end applications through wrapper-agents. 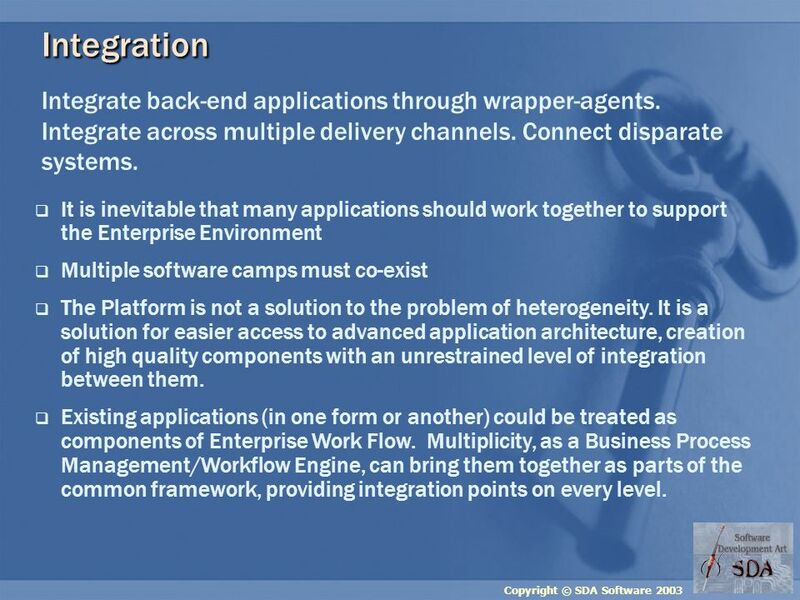 Integrate across multiple delivery channels. 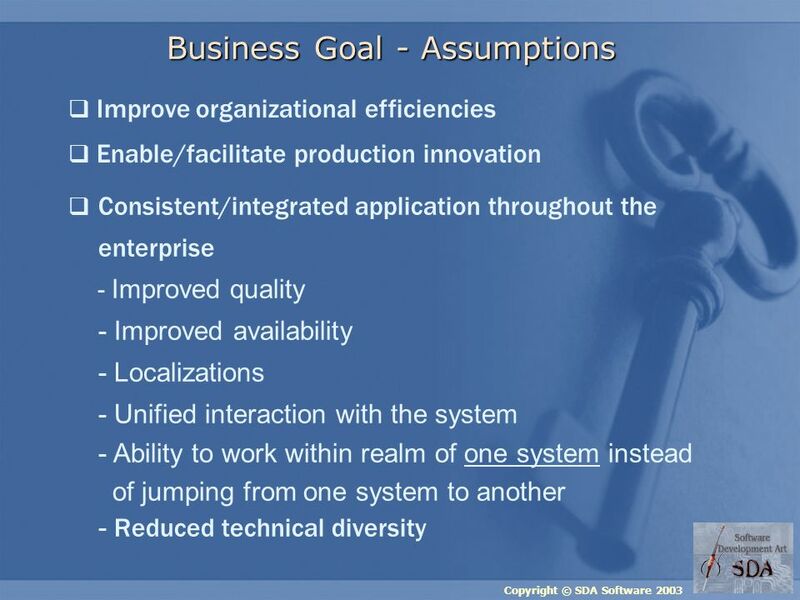 Connect disparate systems. 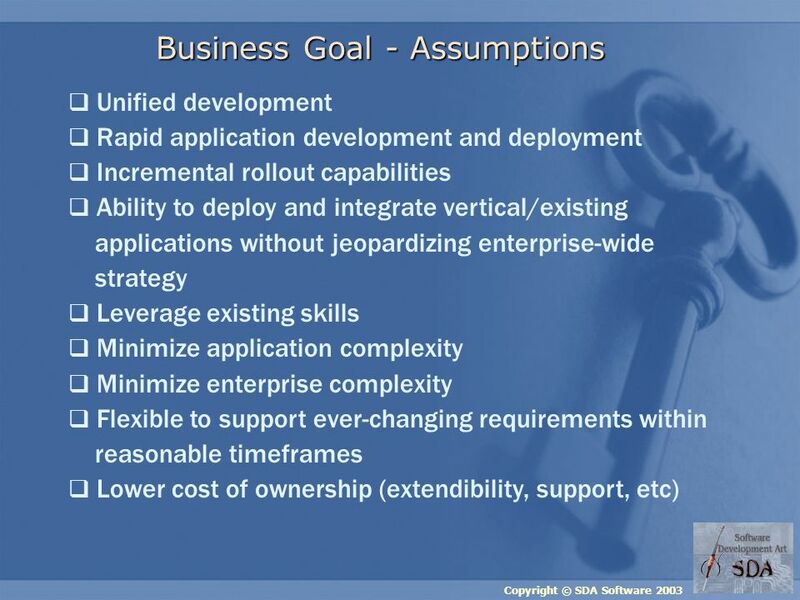 It is inevitable that many applications should work together to support the Enterprise Environment Multiple software camps must co-exist The Platform is not a solution to the problem of heterogeneity. 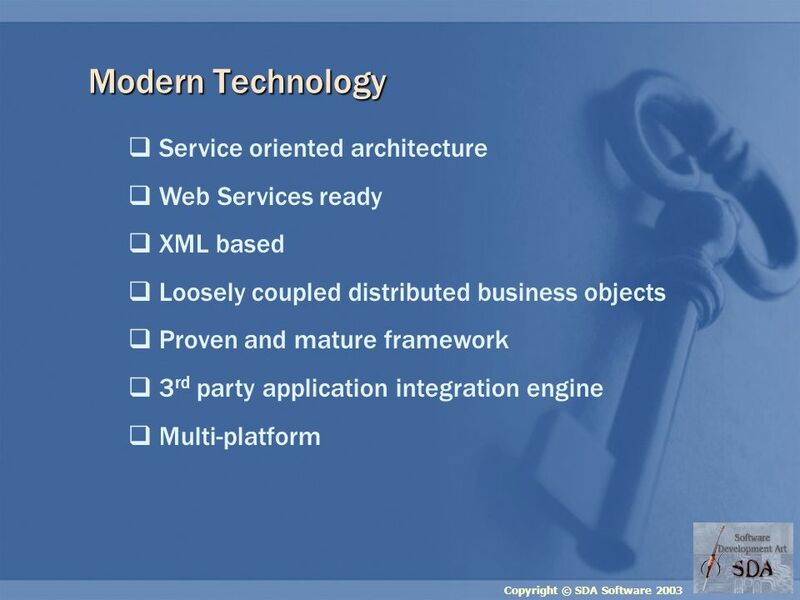 It is a solution for easier access to advanced application architecture, creation of high quality components with an unrestrained level of integration between them. 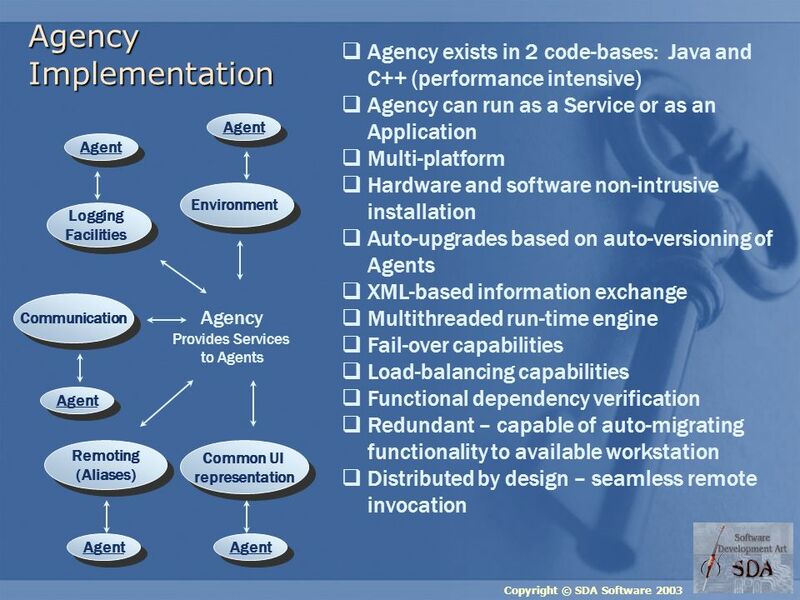 Existing applications (in one form or another) could be treated as components of Enterprise Work Flow. 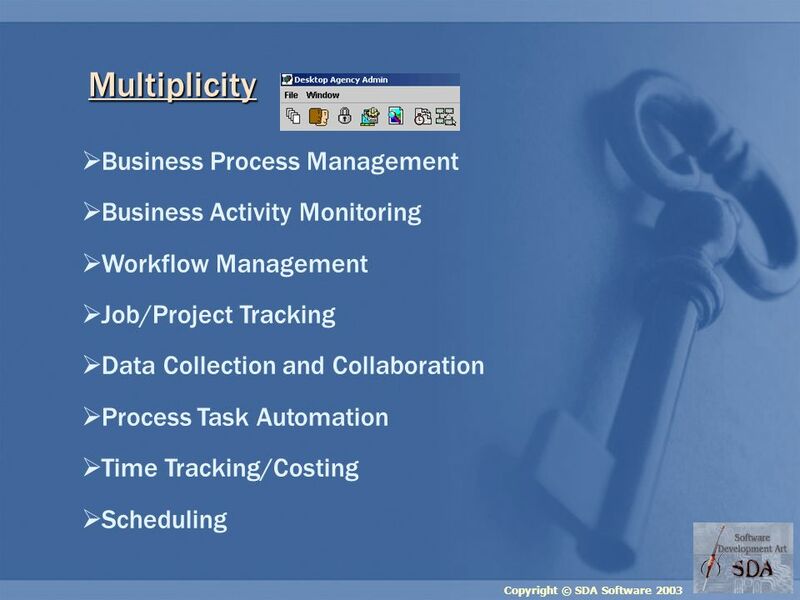 Multiplicity, as a Business Process Management/Workflow Engine, can bring them together as parts of the common framework, providing integration points on every level. 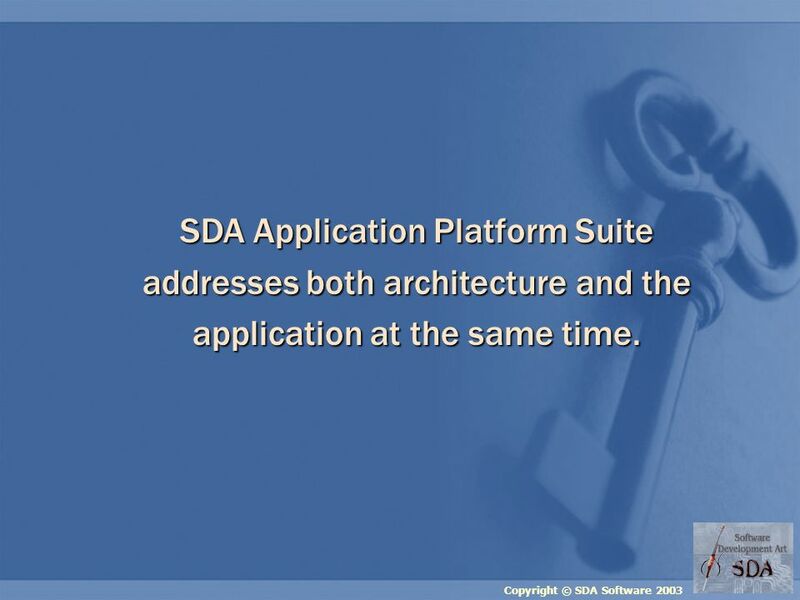 21 Copyright © SDA Software 2003 SDA Application Platform Suite addresses both architecture and the application at the same time. 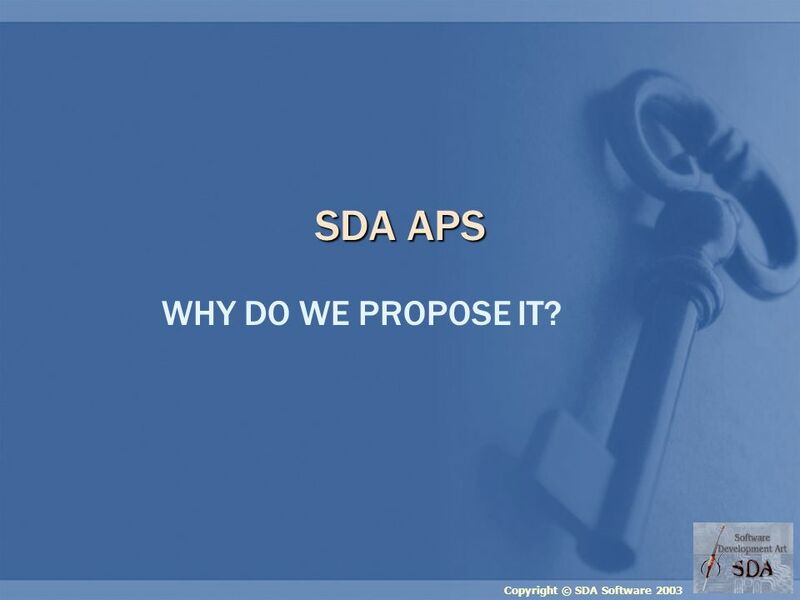 22 Copyright © SDA Software 2003 SDA APS WHY DO WE PROPOSE IT? 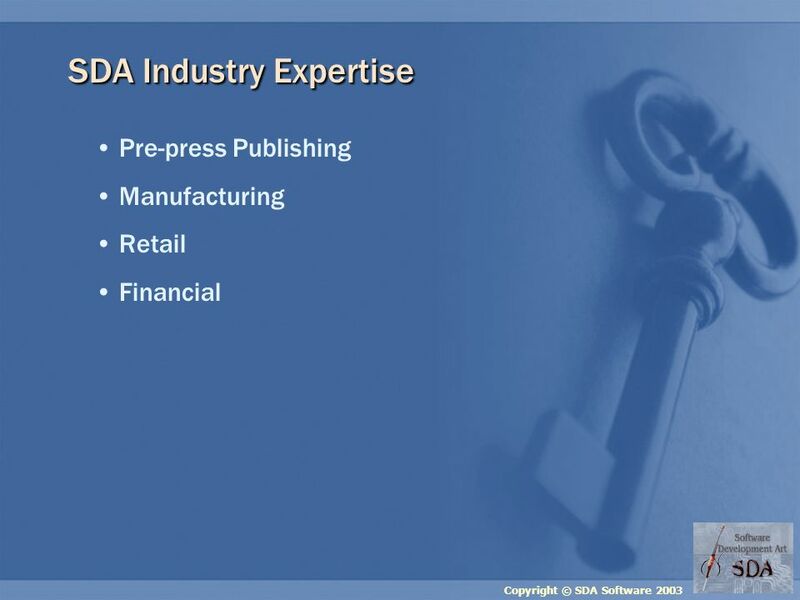 36 Copyright © SDA Software 2003 We are ready to help! 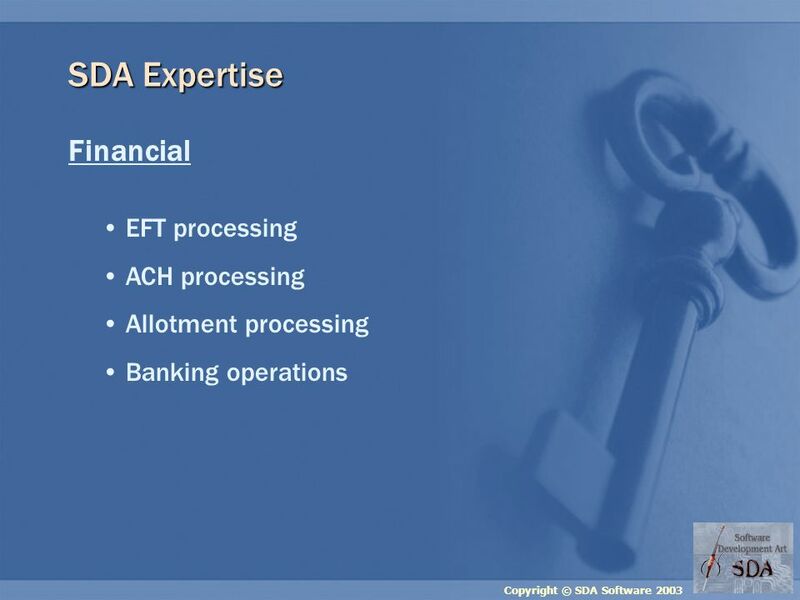 You manage your business, we manage everything else for you SDA Technology – ready to be deployed! 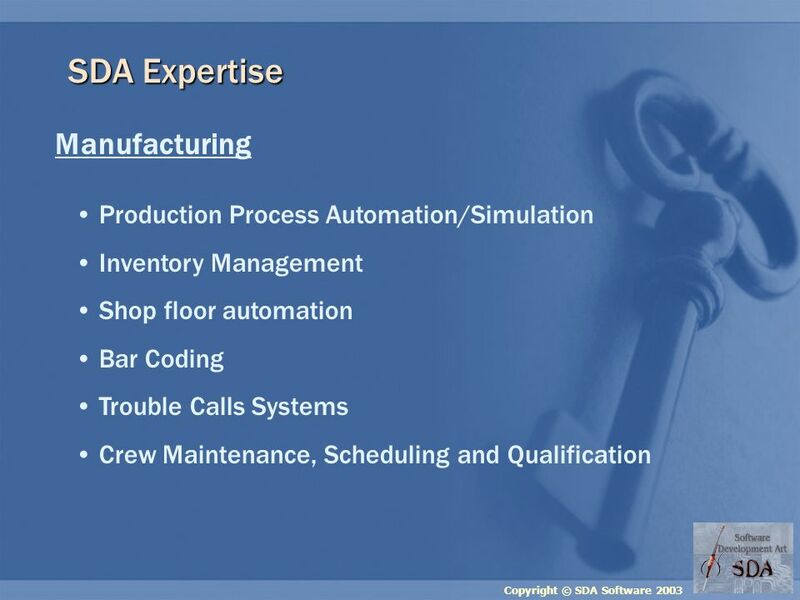 SDA Talent – ready to create! 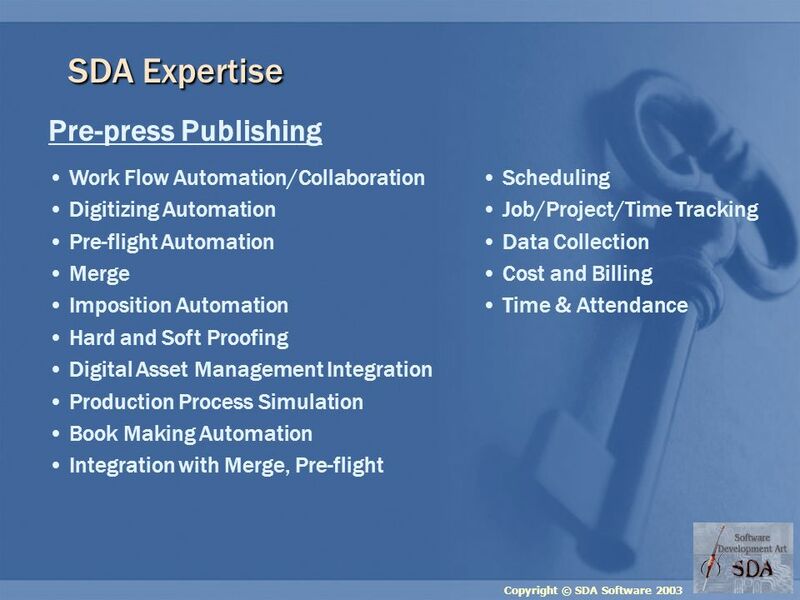 SDA Talent – ready to create! 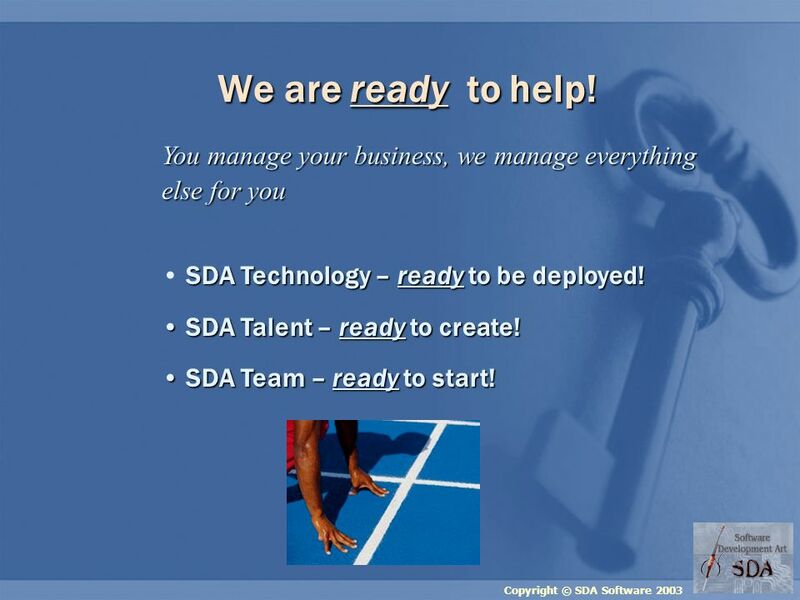 SDA Team – ready to start! 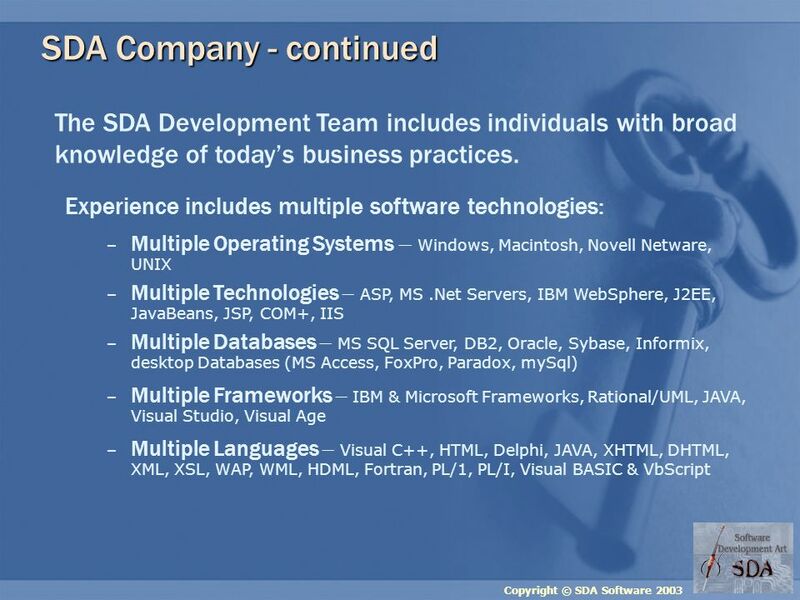 SDA Team – ready to start! 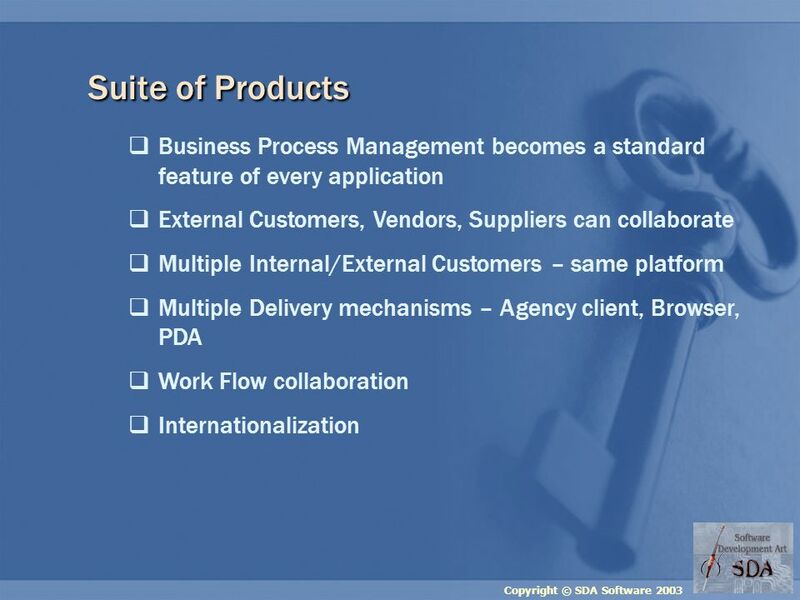 Download ppt "Copyright © SDA Software 2003 SDA Application Platform Suite Stay ahead, Design your business, Achieve your goal!" 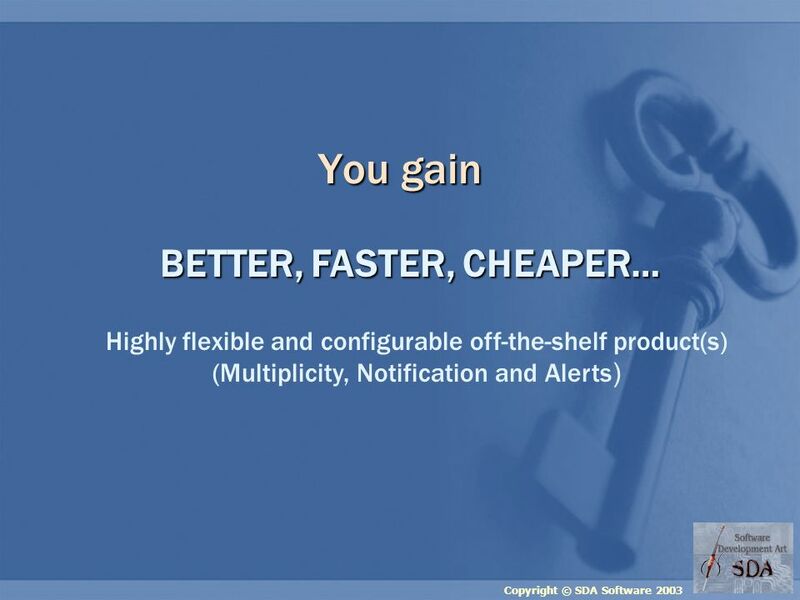 Heroix Longitude - multiplatform, automated application performance monitoring and management software. 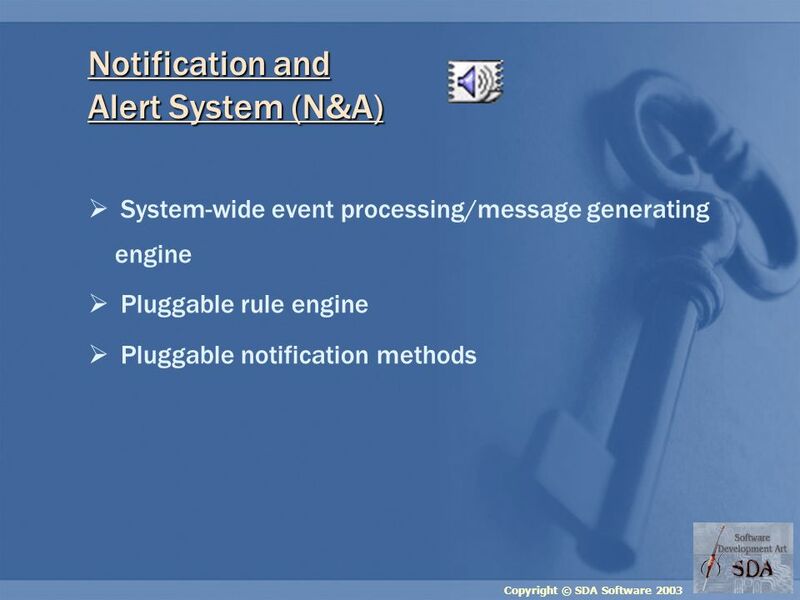 © eComScience Pvt. 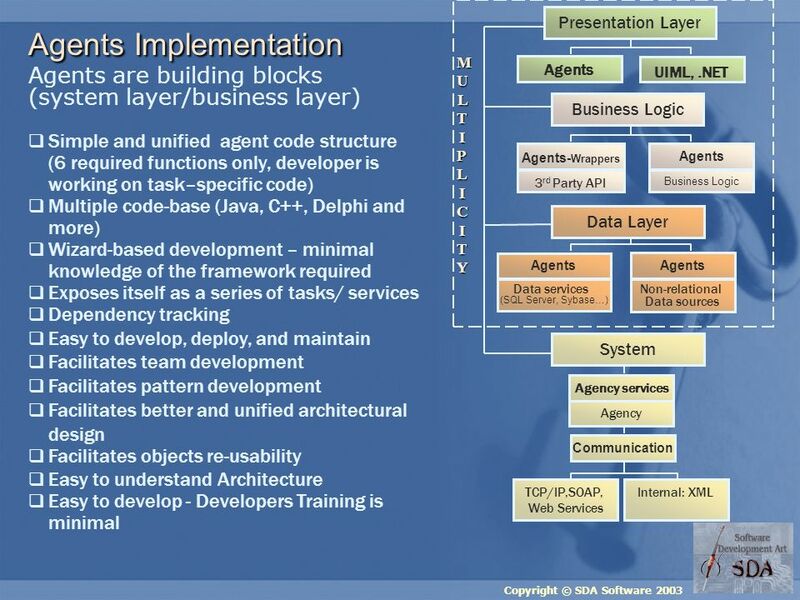 Ltd OffshoreSoftwareDevelopment eComScience Consulting perspective. 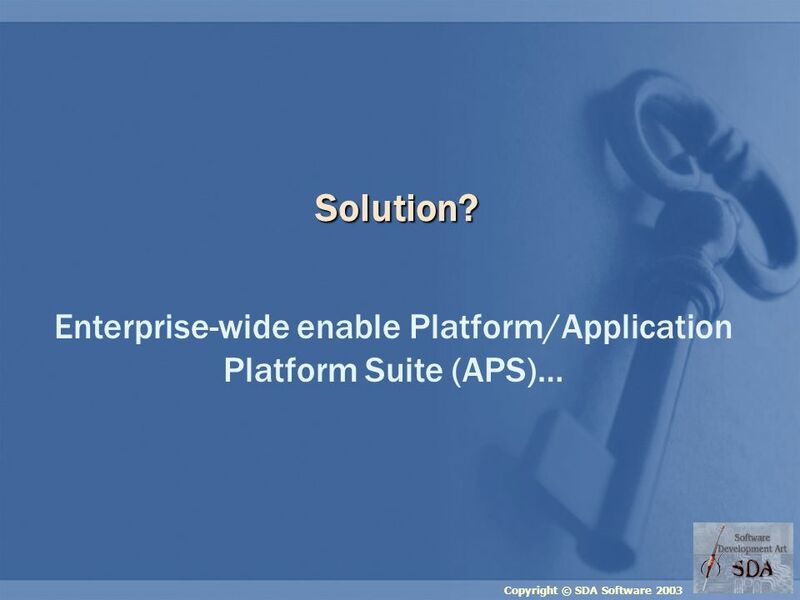 Welcome to this Presentation Flexible solutions Flexible solutions. 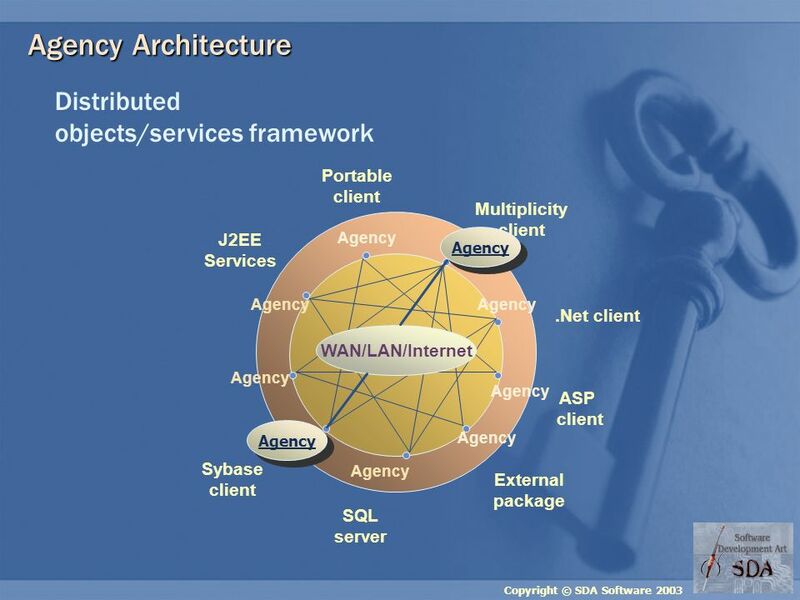 Communication and Networking Services Networking Services. 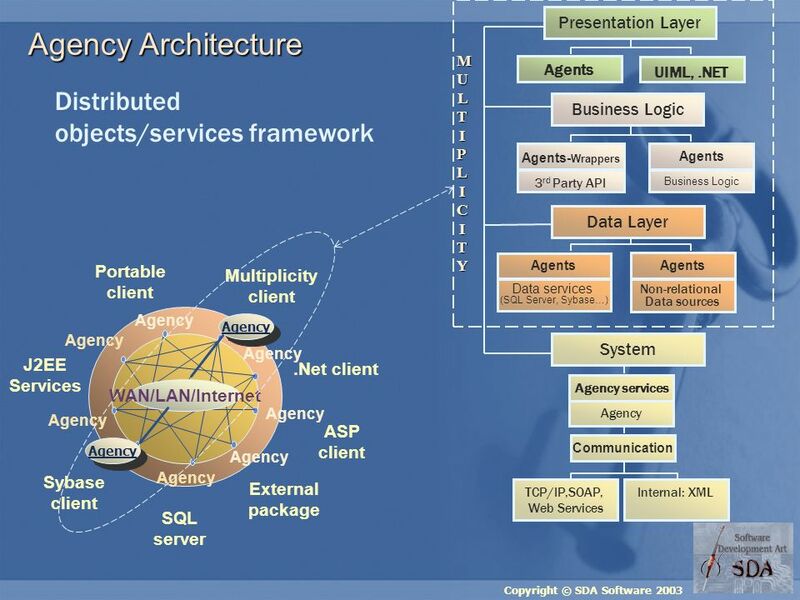 Copyright 2002: LIIF Technology Architecture Review Database Application Architecture Database Application Architecture Collaborative Workgroup Architecture. 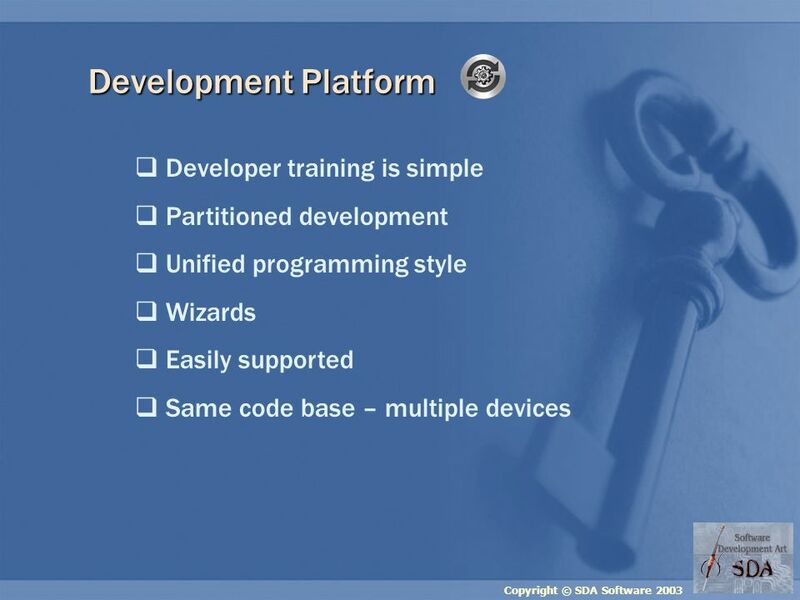 Distribution and components. 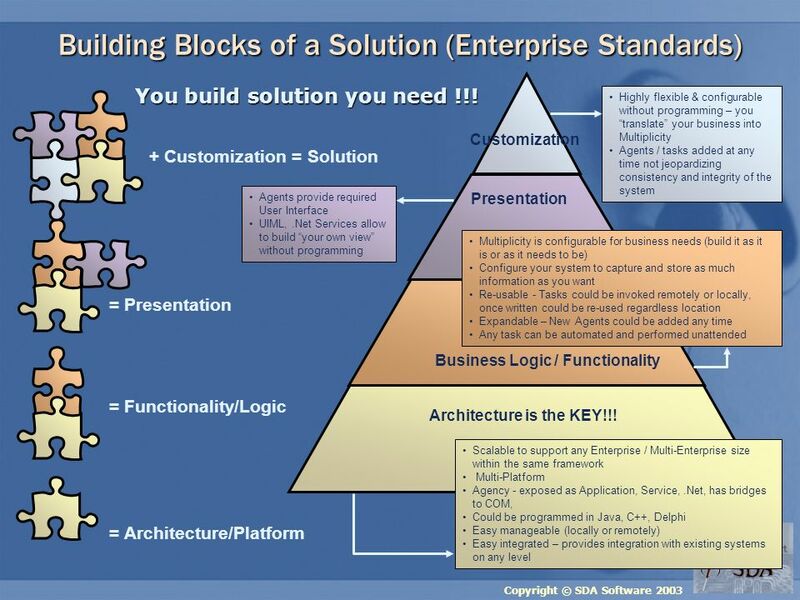 2 What is the problem? 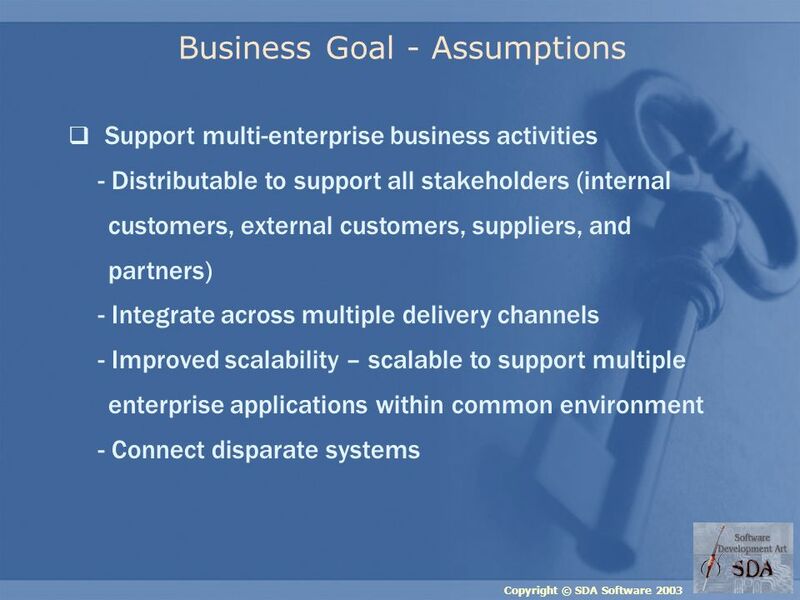 Enterprise computing is Large scale & complex: It supports large scale and complex organisations Spanning.